The cloud is the foundation of an efficient IT operation in the digital age. More often than not, one cloud platform is not sufficient for at least two reasons: 1) Different cloud platforms service different purposes and each has specific strengths and weaknesses hence embracing the plurality of platforms in a best-of-bread manner is more productive than trying to fight it. And 2) To avoid a technology lock-in on one vendor or platform, creating a diverse skill set preserves technical sovereignty. Therefore, building a proper multi-cloud management capability is key to a successful and efficient cloud strategy. To give some guidance about the technical approaches to build such a capability, we introduce the meshcloud multi-cloud management maturity model. The first stage is easy to reach – it is the natural stage when you do not take any actions, maybe because you do not realize you have a multi-cloud challenge to solve. However, the effects rise nevertheless. Due to disorientation of users individual platform or ad-hoc processes will be established and you end up with a silo-structured organization loaded with unnecessary complexity due to different access routines for different platforms. But that is not necessarily the greatest worry: people tend to shortcut complexity and lengthy processes and public cloud vendors make it way to easy to access cloud resources within minutes with the simple (yet virtual) swipe of a company credit card. The nightmare has a name: Shadow IT! You end up with individual, unconnected, unregistered public cloud accounts the company pays for but has no efficient way to manage. All comes down to individual initiative and discipline which might go well, but it’s an anarchy and there is no way to ensure rules and regulations are followed and compliance is uphold. This has severe implications for security or regulatory duties, e.g. you cannot give full report about data processing activities as required by the GDPR. Accounts might be shared among colleagues. When people leave the company, no one guarantuees credentials are rotated. And so on. Therefore, this stage is like purgatory – you suffer from sins of the past and want to get out as soon as possible. To receive remission, action is necessary. So we realize: let’s bring order to the chaos. We try to standardize, define common processes, keep track of tenants and workloads out there in the clouds or running within our own private cloud. In Stage 1, we define a process to provision and configure tenants on the clouds we use. Someone is defined responsible for a certain platform, to keep security and governance up and to provide users with what they need to get their cloud projects up and running. Regarding implementation, we move quick and take the tools we have and are familiar with: a ticketing system to order cloud tenants from the IT department which someone creates manually or provides manually or with some scripting on her or his own. What about controlling? Let’s keep track of cloud tenants in an Excel sheet or export a list of projects on a platform to see who’s doing what and how much of it. It’s tedious and everyone hates it – those who want to use the cloud because there still different contacts for different clouds and because they have to wait so long to receive their credentials. And operators hate it because they are doing dull work and lots of it instead of improving processes and evaluating further advanced technologies. The cloud is all about automation and the multi-cloud is, too! So this stage does not fulfill the promise of self-serving, on-demand, scaling capacities with a few key strokes, but falls behind the spirit that comes with cloud technologies: automate ALL THINGS. With further investment, we reach stage 2 where we have reached the stage of integrated, automated processes to provision tenants and user accounts in all relevant cloud platforms. We might even have established a self-service where users are able to set up cloud projects 24/7 at their own pace and needs. There is a portal where they can order cloud projects or ressources and after a while they are ready to run. So all good now? At first, it might be. But over time, workflows and tenant configurations evolve and after some months or years it becomes hard to tell which tenants were created and configured by which version of the process. Also, do people reliably remove resources when they are not needed anymore? And how are resources in different clouds connected and how do they depend on each other? Hopefully, the documentation is available and up to date – otherwise, we still lose orientation between platforms and projects consuming and possibly spanning them. 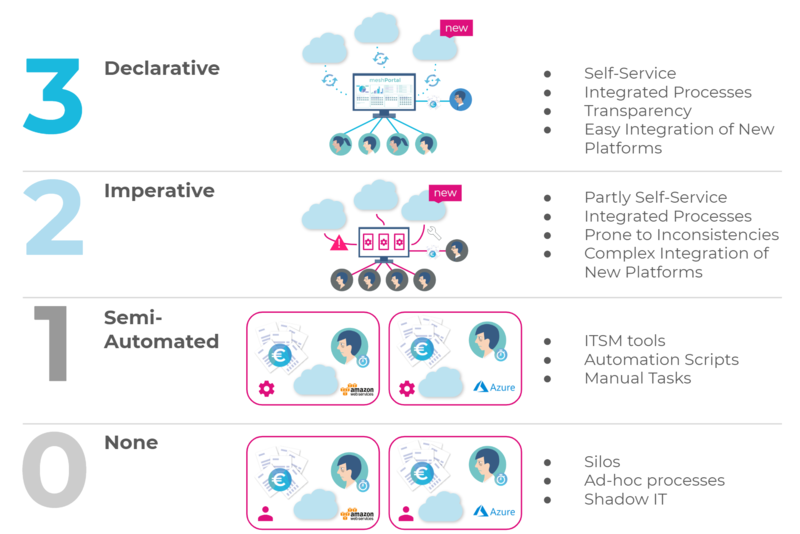 Meet declarative multi-cloud management! You already know the concept from the deployments of your workloads where it labels as infrastructure as code. You describe the desired target state and the system works it out for you. Declarative multi-cloud management means the same, but on an organizational, cross-platform level – Organization as Code as we framed it. Robustness: Distributed systems might suffer from weak network links which might cause process flows to stall and fail. However, with the target state clearly defined, the system can try again and again to finally reach the desired state. Prevention of local changes: You know the “colleague is on vacation, but I need urgent access” situation which might lead to a quick and dirty permission to cloud projects by an administrator. More often than not, those changes stick longer than intended – the human lazyness is my witness. However, a declarative multi-cloud management system would roll back those changes at the next sync. Decoupling of semantics and implementation logic: With a descriptive configuration you describe what you want, not how to do it. Therefore, flexibility remains with the system on how to implement reaching the desired state which means more freedom to improve the multi-cloud system over time. Documentation and Auditing: If every configuration change is tracked in the manifest and version controlled, it is always easy to report, audit and track who had access to which system or data and how long, why and by whom. You see that declarative multi-cloud management has many advantages – it’s for some reason the paradigm turned so successful with configuration management. Therefore, meshcloud put the declarative paradigm at the heart of its vision of an agile, but full-control multi-cloud management. If you want to learn more, we are happy to start the conversation with you. Reach out to us via mail, social webs, phone or any events we attend. We are looking forward to hear your thoughts!